Diploma in Textile technology and knitting at the “Istituto Marangoni” – Milan (Italy). I was born 1963 in South-Korea just 10 year after the war in a difficult economic situation. I am the youngest of 4 brothers, the other ones are all boys. From what I can remember I found my passion in arts. I play the piano and the guitar, I paint with watercolors, I make ceramic, and I can still remember the very first clothes cut out by using the curtains of my house and the subsequent reaction of my mother, not so enthusiastic (euphemism!). But I did not give up! Absolutely not! With a big help and sacrifices of my family and my commitment, I graduated in Arts & Crafts and then I graduated in Fashion at “The Institute of Kook-je” in Seoul. After several years of work in Seoul, I decided to work abroad to improve my professional background. I was undecided between going to Paris in France or to Milan in Italy; the two capitals of European fashion. I chose Milan. Between the end of the 80’s and the beginning of the 90’s I moved to Milan to attend, the courses of the European Institute of Design (IED) and at the same time the ones of Marangoni Institute. Moreover, in the same period I had been working for several companies, so I decided to study Italian language to better communicate with my Italian clients. It was a very intense period of my life, but also really beautiful as I was preparing my future. At the course of Italian language, I met Giovanni, French mother tongue, at that time working as analyst at a Milanese financial advisory company. After a few years I got graduated at both the Milanese Institutes and that allowed me to furthermore develop my work as designer with new collaborations. Shortly after Giovanni and me got married and moved to the Republic of San Marino. We both continued our work for a few years, but we also decided to have a child. Even in France and South Korea, the family is very important and counts more than anything. Therefore, not having family in the vicinity, I decided to pause my activity as a designer to grow and educate my son, obviously with my husband. Some things can only be passed on to children by their parents. In 2017 my son Francesco was of age, graduated from the scientific high school, model and 3rd Dan of Taekwondo. 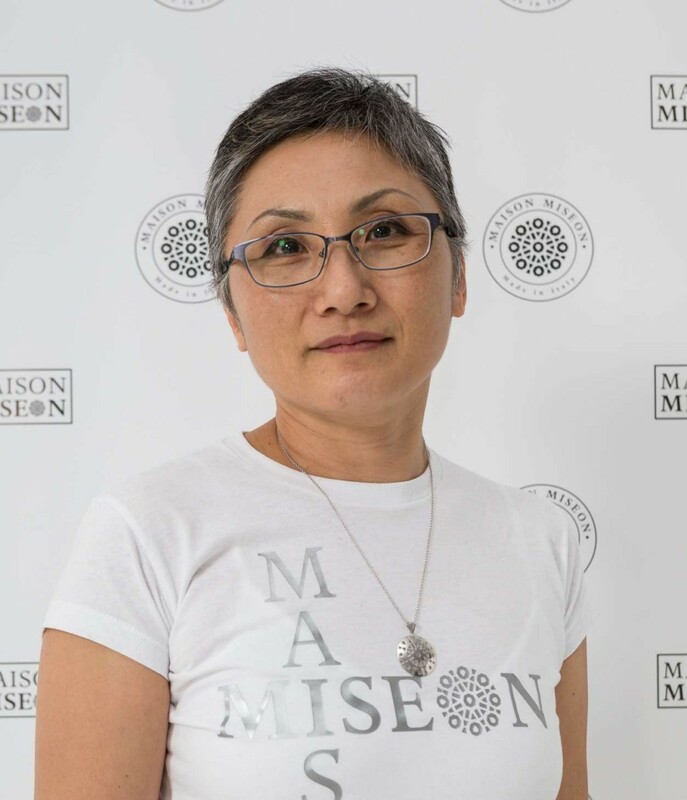 Definitely made as a mother, and wife, I decided over 50 years to get back into play and, on May 8, 2017 (day of the women’s party), I took away a professional satisfaction by creating the brand “Maison Miseon”. Given the numerous studies carried out in Korea and Italy I am highly qualified in knitwear, in the knowledge of materials and in the search for stitches. I really want to keep the tradition of the past and, as a stylist, I want to personally carry out the first phase of the processing that goes up to the realization of the first prototype and, precisely, without using the computer. The line, a mix between the oriental philosophy and the excellent Italian manufacture, wants to be essential and at the same time sporty and elegant. Clothing items are ideal for people of any age and with a strong personality. “Maison” means “home” in French because I want to welcome you to my home. “Mi Seon” is nothing but my real name. The octagon recalls the symbolic meaning of the number 8 which corresponds to the perfect rhythm of harmony and happiness and is universally regarded as the number of cosmic equilibria. The eight is also a magic number in nuclear physics expression of stability. Rotated 90 ° is the symbol of infinity where time, symbolized by the hourglass, never ends; while the drop is the symbol of nature and creation. As a doubling of the number 4, the eight is a pragmatic number that highlights the qualities of a leader. The logo therefore has a strongly positive connotation. I make clothing mainly for women and accessories such as bags and jewelry. My ideal woman is strong, determined and modern. Her look reflects his decisive and free personality. Because women are like that. She’s fine with herself, has a thousand interests and manages to reach any goal. My clothes can be worn in the morning to go to the office in the evening at a party. They are therefore comfortable, elegant and made with excellent raw materials by highly specialized companies. Woman’s sweater, pure cashmere, with stylized collar and cuffs. The garment is very soft and refined. The shirt is light for the high quality of cashmere. T-shirt with a wide crew-neck in stretch jersey. The choker is provided with loops that allow the insertion of a scarf or another accessory such as a soft strap for example. Two rhinestone decorations embellish the garment: the name on the front and the logo on the back. Available in black, white and pink. The t-shirt is made in Italy. A unique opportunity: two items of different length (asymmetrical) at the price of one. Made of pure wool and with an excellent manufacture. This unisex and unique garment will bring out your strong and decisive personality. In fact, the two parts can be used separately. Available in black and lilac. Stretch jersey t-shirt with a narrow line. The detached neck and the front opening make it a special garment. The unique piece is made particularly feminine with the addition of two rhinestone decorations: the name on the front and the logo on the back. Available in black, white and Bordeaux. The t-shirt is made in Italy. 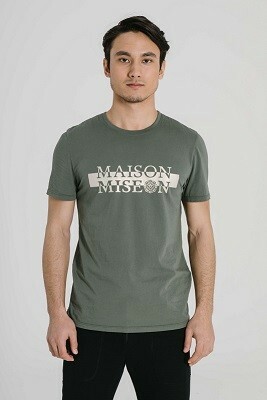 Several T-Shirts with the Maison Miseon logo inserted with the method of heat-welded artisanal printing. The print is made by hand and then one after the other. In this way each T-Shirts is a unique item. Even the designs that incorporate the logo are designed by the designer. The T-Shirts are made in Italy in 100% cotton. Polo shirt very refined, personalized, with a particular cut that makes it narrower on the sides. The garment is embellished with two embroideries: the word “Maison Miseon” behind the neck and the logo on the chest. Even the buttons are customized. So, we do not talk about the usual Polo, but from a garment made and designed specifically for our loyal customers. Available in black, blue and white. The polo shirt is made in Italy. Item of clothing of excellent workmanship with a multi-purpose accessory; hair / neck warmer. 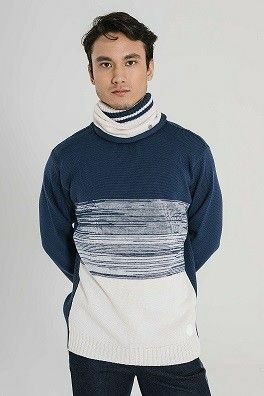 100% wool jersey, two-tone, dropped and matched with a complimentary hair / neck warmer made by a highly specialized company selected by our company. Several men’s T-shirts with the Maison Miseon logo inserted with the method of heat-welded artisanal printing (the print is handmade by hand one after the other). As for the women versions, also in this case each T-Shirts is a unique item. Even the designs that incorporate the logo are designed by the designer. The T-Shirts are made in Italy in 100% cotton. Casual jacket, unlined, finished with extreme care, in neoprene with hood and sleeve customized. 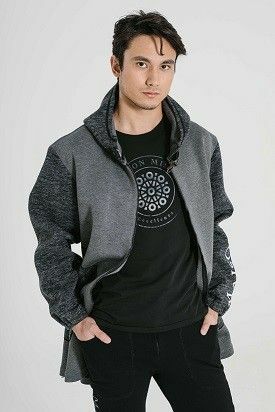 Ideal jacket for mid-season and is very light. The print is made by hand and then one after the other. In this way, each jacket is unique. The jacket is made in Italy. We also have other unisex accessories such as hats embroidered or printed with the method of heat-sealed print craft, some keychain and many other things.